When most people set out to design their children's space, the project often begins with picking a theme. Typically, kids are drawn to a favorite "celebrity", like Hello Kitty, the Avengers, or Paw Patrol. That can be a super fun direction, but a big problem is inevitable. Those favorites often change more often than the sheets get washed. A cute room becomes quickly irrelevant to the child, and they outgrow it before you are ready to reinvest in another update. My solution, skip the characters! For this project, I had two bedrooms to develop that would be dedicated to children. This particular family has three young girls, but they will also be sharing the space with both boy and girl guests. I knew the spaces should appeal to everyone. Like the rest of the home, I was inspired by color. Bright vivid colors, against soft backgrounds. Graphic patterns and textures would also be key. And, to top it off, vintage toys sprinkled in to add personality and a sense of whimsy. First up, the nursery. This room has ceilings that vault up over 15' high. Ample natural light coupled with white walls, and a pastel green ceiling make this otherwise smallish room feel completely voluminous. The theme of color comes in to play with framed vintage scarves that "wallpaper" the walls in the room. The bright colors and bold patterns against the bright white walls create an atmosphere of fun that is surprisingly peaceful. What is great about this solution is that as this room morphs into another guest room space, all that needs to change is the bed. This wall features an assortment of larger frames. By adding mat boards to some of the frames, some of the bolder patterns are softened and a pattern rhythm is created. Nighttime stories are a must in any child's bedroom. This corner has a whimsical modern rocker. The patchwork fabric reiterates the multiple textiles wrapping the room. The silvered stump table echoes the nature outside the window while adding sparkle and any little one would love. This bold blue vintage dresser and unique green lamp add to the color punch in the room. I adore the unexpected accent of painted furniture. Next up, the sleeping loft. This space is primarily utilized by the family's two oldest girls. But, as their baby sister grows, and guests arrive for visits, sleeping space needs to be ready for relaxation. This room is positioned in the third floor attic space of the home. The walls are very angular making hanging space for artwork very limited. This inspired me to add a bold pattern to the wall paint. I designed a horizontal stripe pattern that would utilize a tone on tone pale blue color. The stripes are set 9" apart to divide the tallest wall with equal spacing. As the stripes meet at each corner, the color is switched. Smooth transitions make this small detail pack a strong punch. This sleeping loft provides beds for four. The bed frames are a classic Jenny Lind inspired construction, and have been made special by the addition of four one-of-a-kind handmade quilts. Although the quilts were made to be roughly the same dimension and color palette, their patterns are unique. The bedding becomes the primary artwork for the space, however, an impressive vintage carnival ride sign hangs between two of the beds on the focal wall. The bright quilts and carnival sign are the perfect accent against the striped walls. 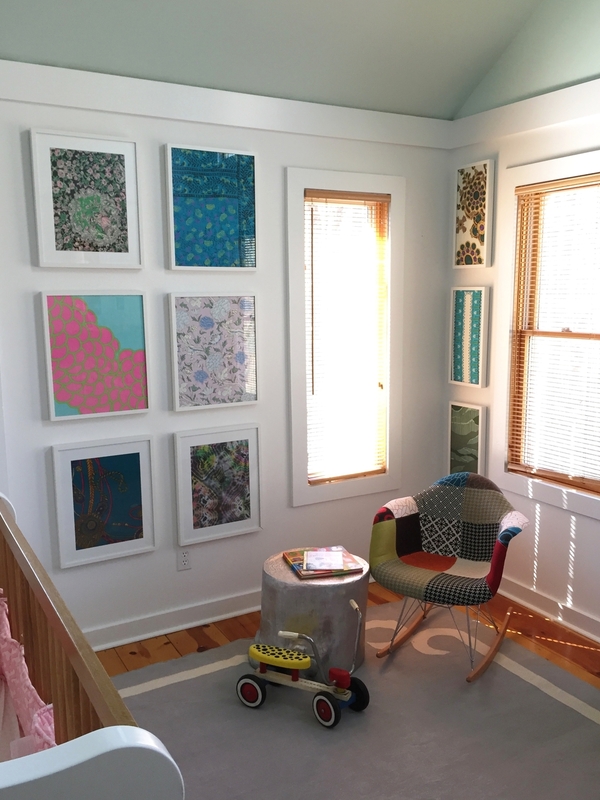 As you can see, the flip-flopping of the paint colors plays up the playful graphic pops throughout the room. Not everything goes as planned the first time around. It took some time to find a painter willing to attempt my design. This photograph of the other side of the room was taken prior to the final stripping. But, you can see the additional patterns incorporated into the quilt combination. Over each bed on this side of the room, a painting created by the families oldest daughter is featured. Personal touches always make the space complete. As you can see, you can create children's spaces full of personality without the use of a character theme. Instead consider color, pattern, and shape to create a space that is inspiring and timeless. No celebrity endorsement required.